Our high quality silicone wristbands are perfect for businesses, events, and team or charity fundraisers. With our huge range of colours and design customisation, silicone wristbands are a fun and effective way to get noticed! We offer bulk pricing options as low as $0.38 per band for 2000 wristbands! Print your company name, logo, slogan, or whatever you think best reflects your image or brand. 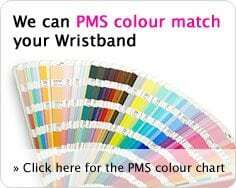 Match your wristband to an exact colour using the PMS Colour Chart below. You can split an order into multiple designs or colours. Be sure to include split order requests in the contact form below. Just keep in mind, there is a small charge for split designs. By far, our most popular wristbands are debossed and then ink-filled below the band surface. The ink will not rub off! Contact us today by filling out the enquiry form below. We will respond within 24-hours. If you know your desired colour, select it from the PMS chart below and write the colour number in the form below. If you prefer to speak to us directly, no worries! Call us or stop in our store today! A note to let you know the magnets & cards arrived safely this morning & I am delighted with them. I’m sure I will require more cards sometime in the future so will contact you again then. I just wanted to let you know we have received the mouse pads and are happy with the results thanks. Hi Gavin, I wanted to say I’m so impressed with the service you provided for Henty Agriculture, the turnaround for the magnetic business cards was phenomenal and the trimming was better than millimetre perfect - accuracy that I had thought would be impossible. They have come out so nicely and the photo required a very specific trim so thank you for doing such a precision job.